April | 2014 | Every good thing…. 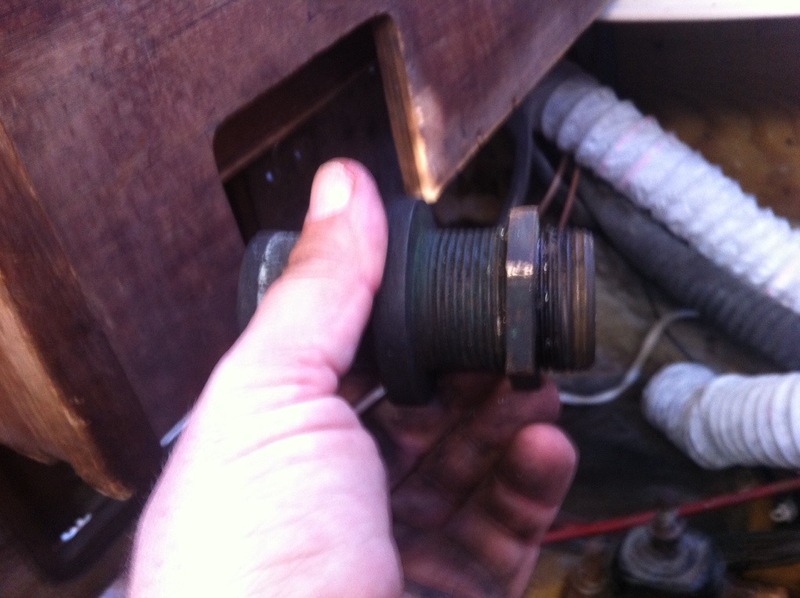 For those not familiar, the stuffing box and shaft log are the bits the propeller shaft enters the boat thru. Being underwater having them leak would be a bad thing. To prevent said leakage I pulled apart the stuffing box yesterday. I was worried it would be corroded to the point of being useless but we got lucky and she came apart fairly easily. The stuffing itself seemed to be a clay like substance, not your standard packing. I then had to clean the parts up. Lucky for us the shaft looks really nice with no pitting under the box. The new shaft log hose ( connects the box to the hull) I ordered from CD was too large. 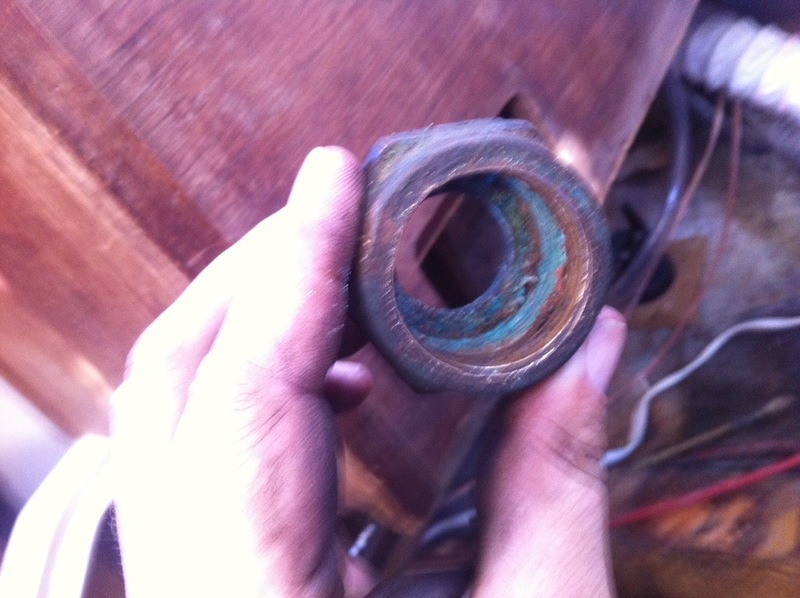 It turns out our shaft log and stuffing box are 1 1/2″ not the 1 5/8 that we got in the mail. No matter, we will putting the stuffing box back together this weekend after obtaining the proper hose. Removed the old throttle lever from the cockpit. Seems the internals are so corroded together I can’t move the throttle independently from the shifter. Hopefully I can pull it apart on the bench and rebuild. This week I have been putting in one or two hours every night fiddling with the Atomic 4 so she will be ready for installation. I have finished rebuilding the water jacket and other things. Here is a couple of videos I made today.. In the above video the motor was not getting any fuel. I topped of the tank and lifted the hose and she started to get fuel. In take 2 the needle valve of the carb stuck open and fuel was flowing out the air intake of the carb and onto the ground. I had to pull the carb apart and fiddle with the valve and float before take 3. I have still to get the motor idling properly and a good volume of water flow thru the water jacket. I will be ordering some parts in the morning and working on the motor more next week. 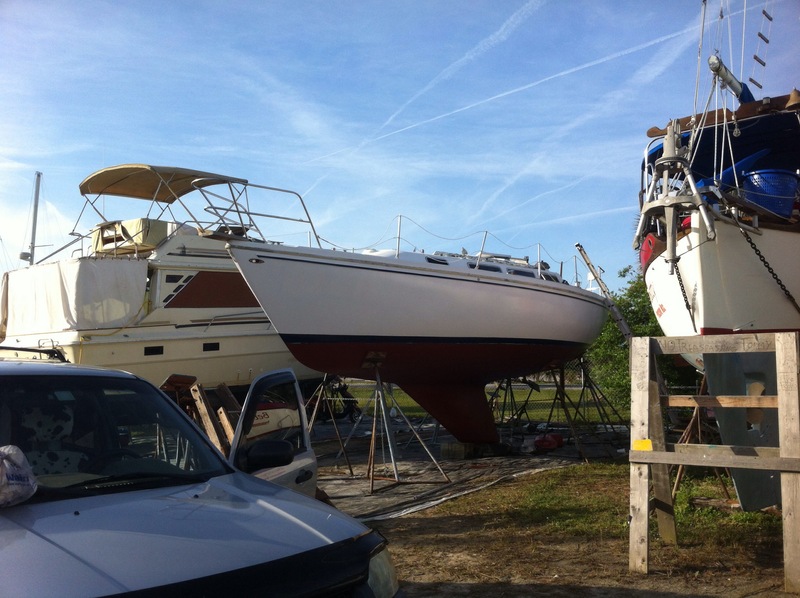 This weekend with Easter and our 22nd Anniversary we will be forgoing boat work. 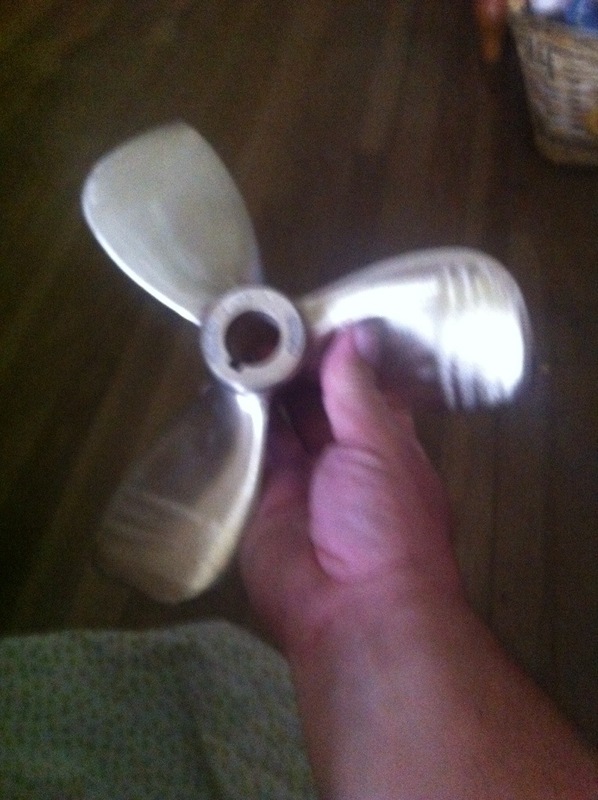 We got the new propeller in the mail this week. 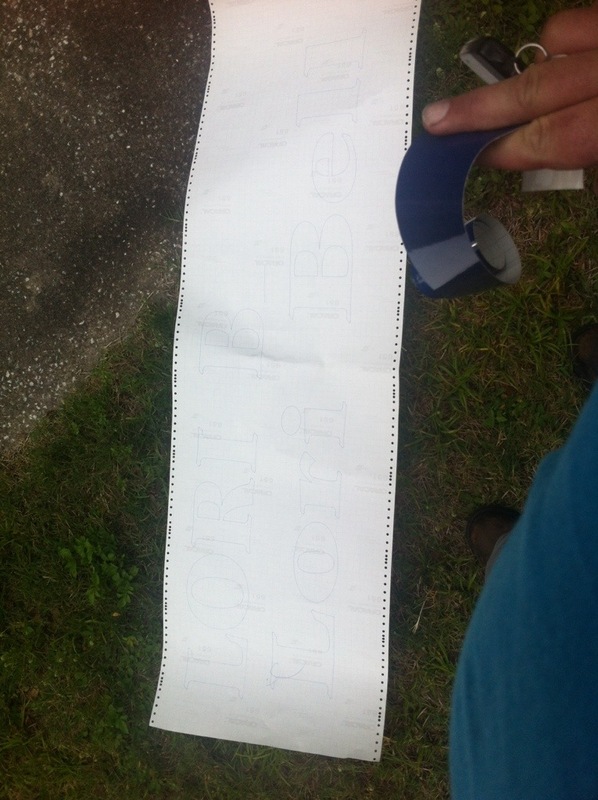 We also got a sample of the lettering for the transom. We will be getting her name made next week. Lori likes the all capital letter version better so that is what we will be going with. Sunday is Easter, the day Jesus arose for the dead. 2014 years after this event he is still the single most influential figure in human history, rightly so. I hope everyone gets a Chocolate bunny and enjoys the holiday. 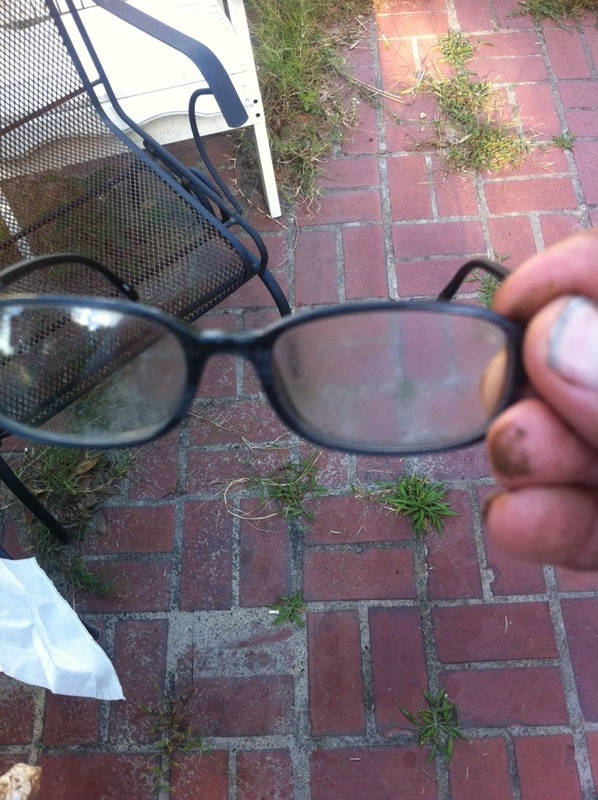 My eyes, they burn…………….. Not really.. It has been a very busy week here on the farm. With spring arriving and the need to plant this years crop…………. Lets us travel back to earlier in the week. After getting home from work I felt it a good idea to clean our motor. 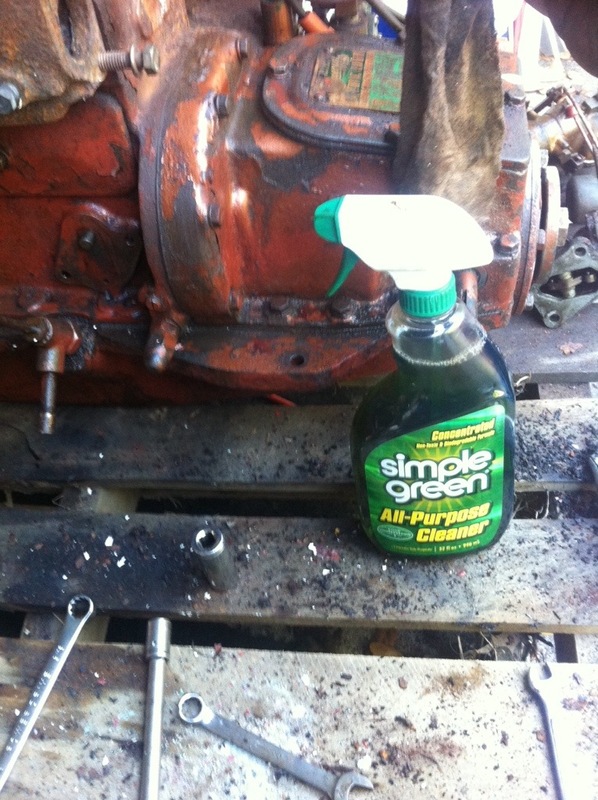 Simple Green does a decent job of removing 50+ years of grease from our old mill. After doing some cleaning I found a stamp with a casting date on it of April 1966. Pretty cool. 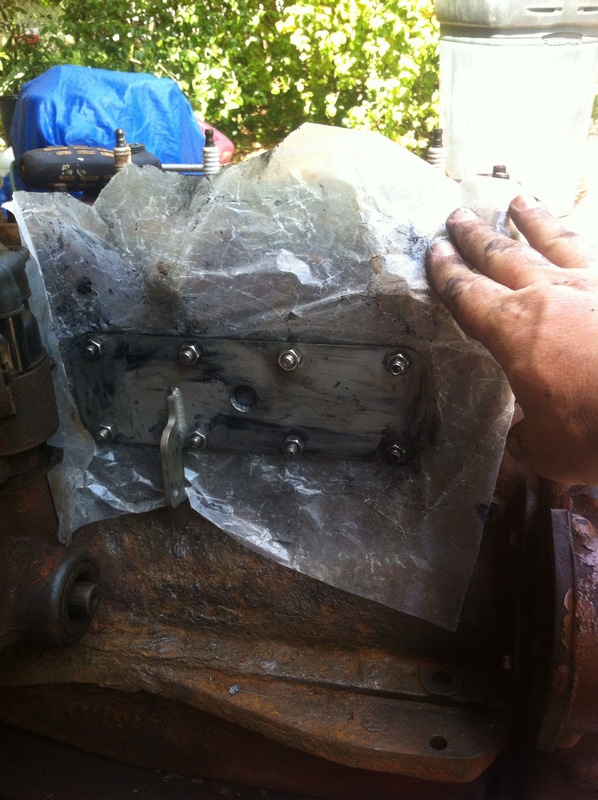 To enable cleaning of the block I removed the carb and fuel pump. Of course I then endeavored to clean those also. 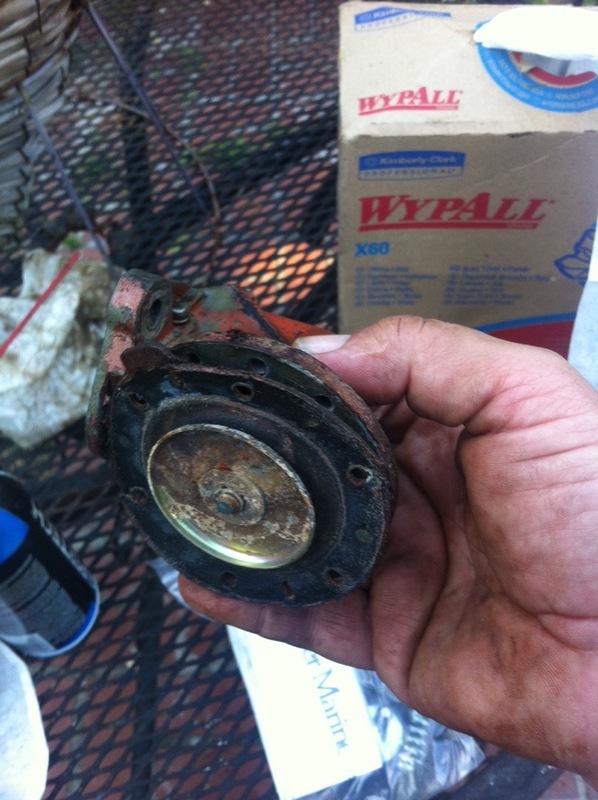 It is a Zenith carburetor with a manually adjustable jet, old school and very nice. 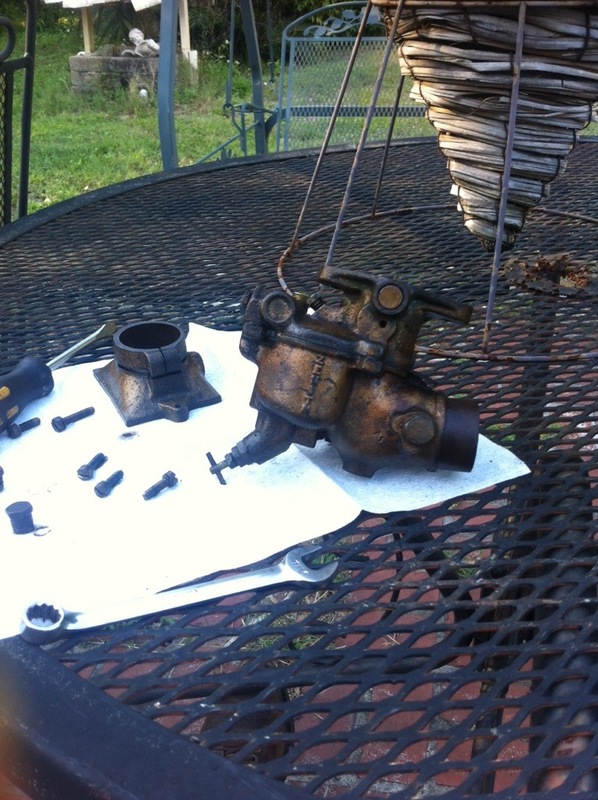 Carb torn apart for cleaning.. There was a bit of gunk in the carb so I started shooting the passages with cleaner. Being brilliant I sprayed into the carb not thinking of how it was going to spray back into my face. Here I reenact the event. Thankfully I wear glasses and they saved my eyesight in addition to capturing some of the crud flying from the passages of the carb. After rinsing my face in the sink I then rebuilt the fuel pump. 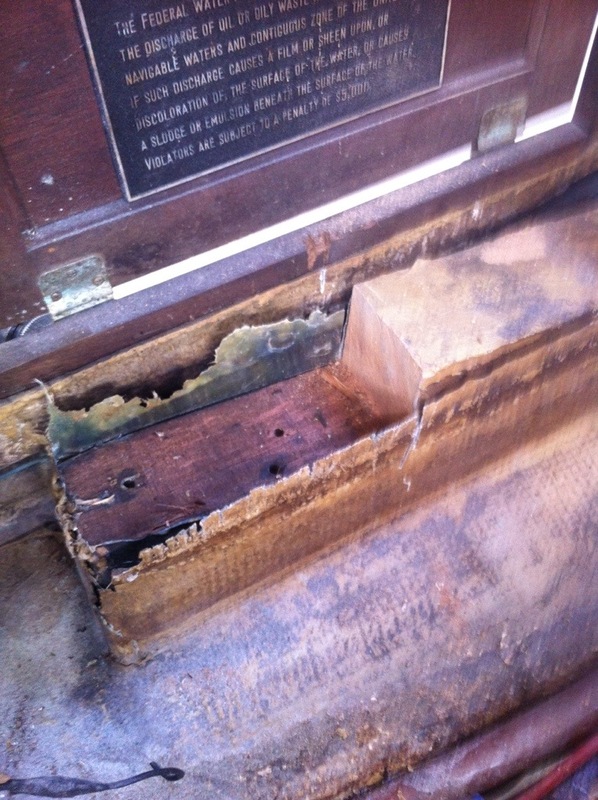 It had some corrosion also. I used a Moyer Marine rebuild kit on the pump, excellent product. 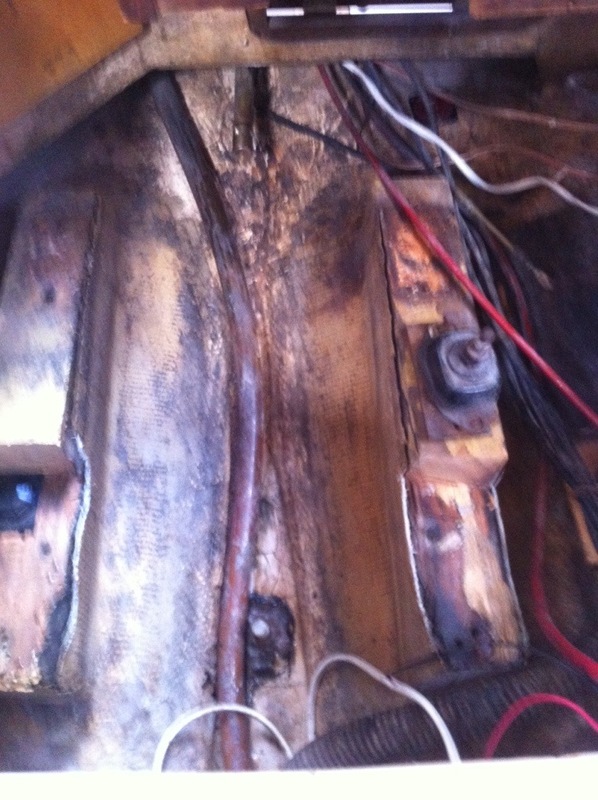 Also last week I did some more work rebuilding the water jacket. 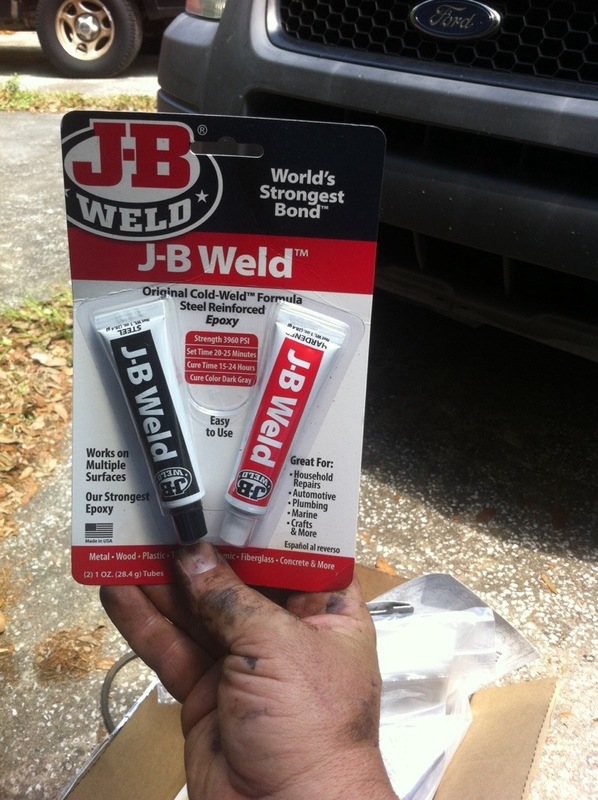 JB Weld to the rescue. I used the old style runny type for the first coat. The second coat I used the 2 part putty, I really did not like it as much, even though it is usable being that it is 80 degrees here it set up in about 4 minutes and was did not adhere to the metal nearly as well a the runny sort. 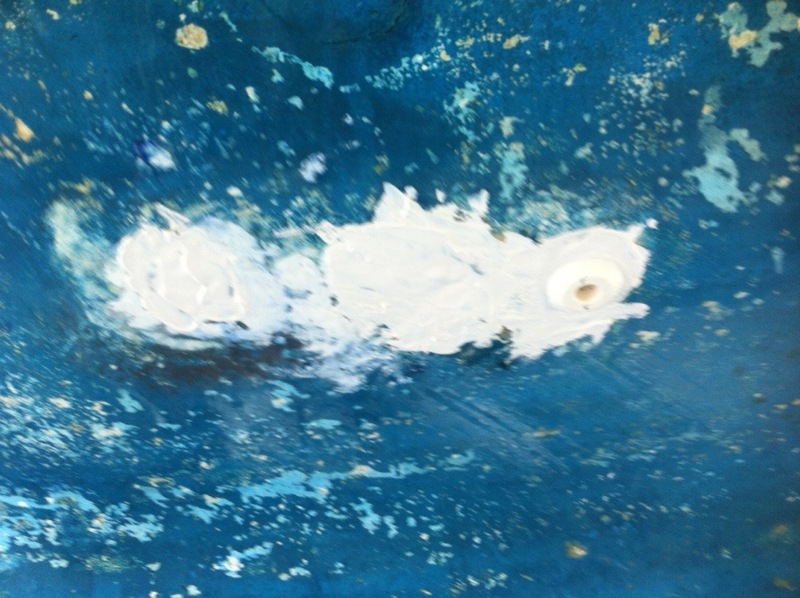 The third coat I did with the old style, much better. Also at the house I bought a small piece of 3/4 plywood and made a jig for the motor. Measuring out the dimensions of the motor and its mounts. I will be using this to aid in setting up the engine beds of the Bell so when the time comes we can just drop the motor and motor mounts in with minimal hassle. 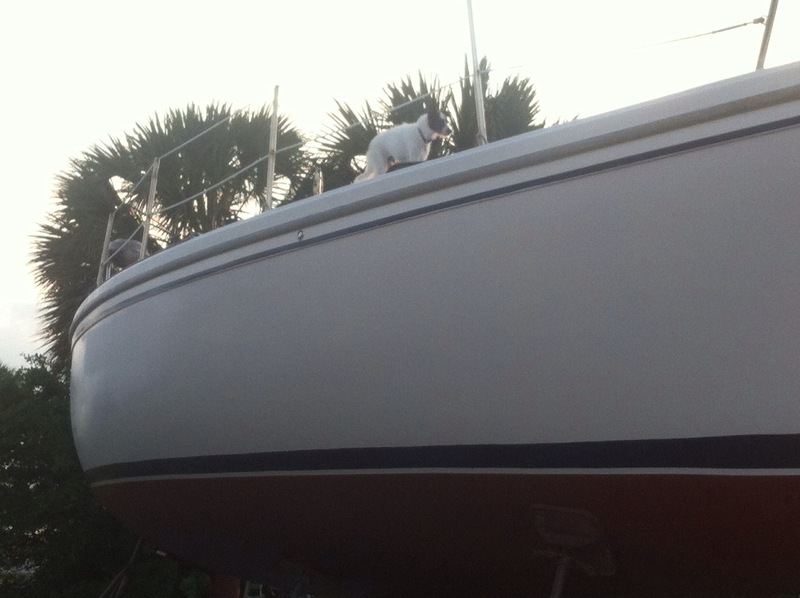 I had to work Saturday so we did not get to work on the boat until Sunday. Starting to line up the jig I realized the existing engine coupler was wrong. 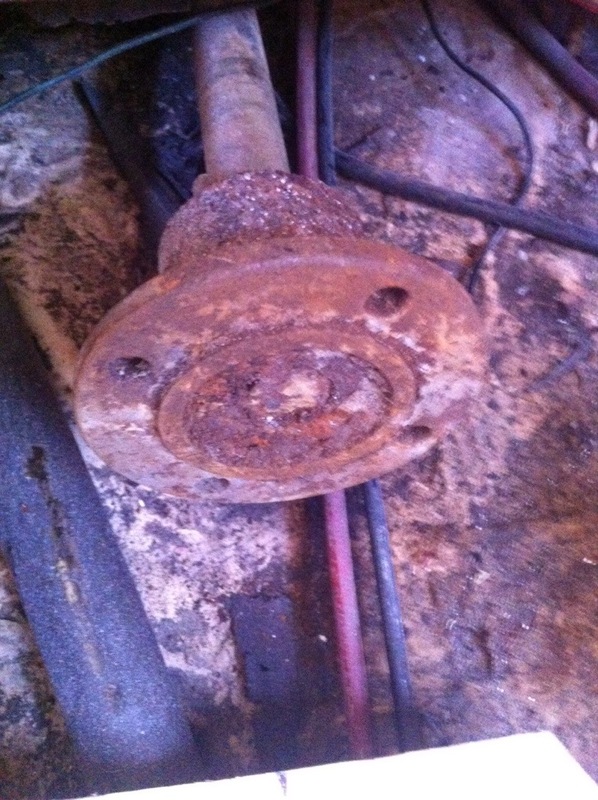 It had 4 bolt holes and not the 3 used by the Atomic 4. It needed to come off. It was held on with 2 set screws, they were corroded so I spayed them with some penetrating oil and tapped on them with a hammer. One turned out to be stripped and the second was stuck so tightly that I broke my alan wrench. Drilling them out only resulted I one broken and one dulled drill bit. Not wanting to cut propeller shaft to remove the coupler I busted out the SawZall and lucky for us the metal of the coupler is much softer than the stainless steel shaft. It only took 3 blades to cut it in half. After fighting with the coupler Lori and I took a break and with Charlie in tow walked over to the park (on the other side of our fence). They were having the “Indian River Festival”. They had a neat kite exhibit. 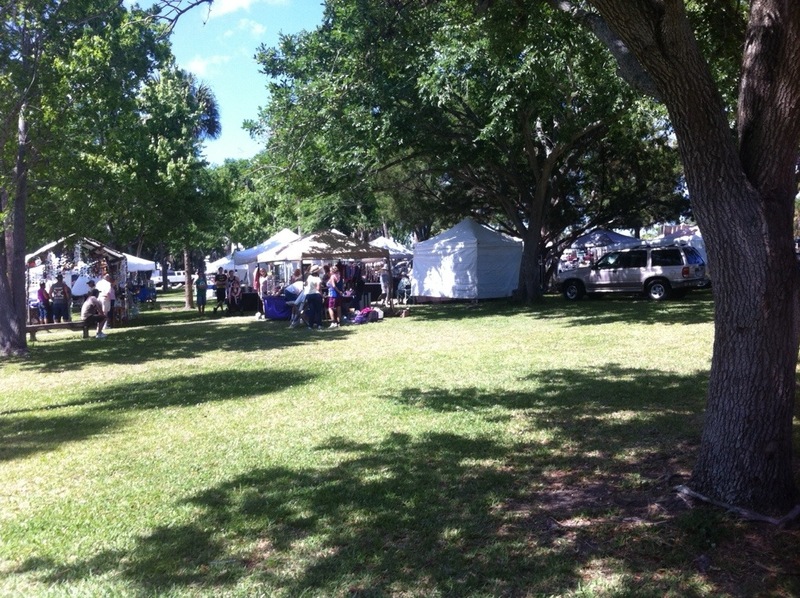 Also some vendor tents, food and nicknacks. We walked around the park for the first time. Sure we looked through the fence, even drove into the park and ate a pizza at a table but never before had we walked the entire thing. Park Gazebo with a nice view. After our park visit we got the motor beds cut down. Let’s go, and I mean GO. For those folks out there not following sailing related events you may not be familiar with the recent episode involving SV Rebel Heart. 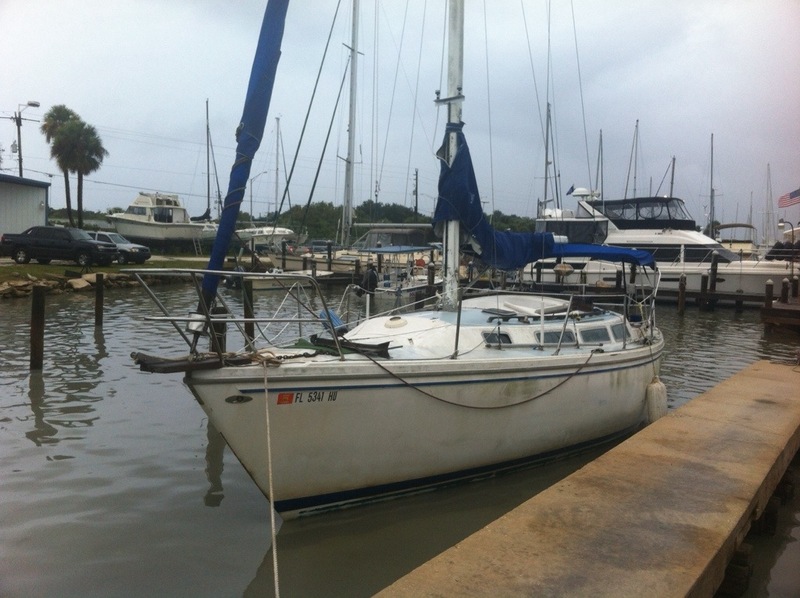 The basic story is a family on a 36 foot sailboat were a week plus out on their way to Australia from Mexico when their youngest fell ill. The decided to call for help and most likely saved the child’s life in so doing. Safely in the end their boat was lost. Here is a link to a press conference the Rescue Jumpers have about the events. My take is they only had a damaged chainplate. No show stopper, but the math was they could not get to help for their child quickly enough so the call was made. Not surprisingly this event has lead some friends and relations to be concerned with Lori and my plans for cruising in the future. Has this deterred us? I can speak only for myself but I have to say, not a bit. Although I would love to do a crossing to Australia and Europe I do not know if we will ever leave the Caribbean. 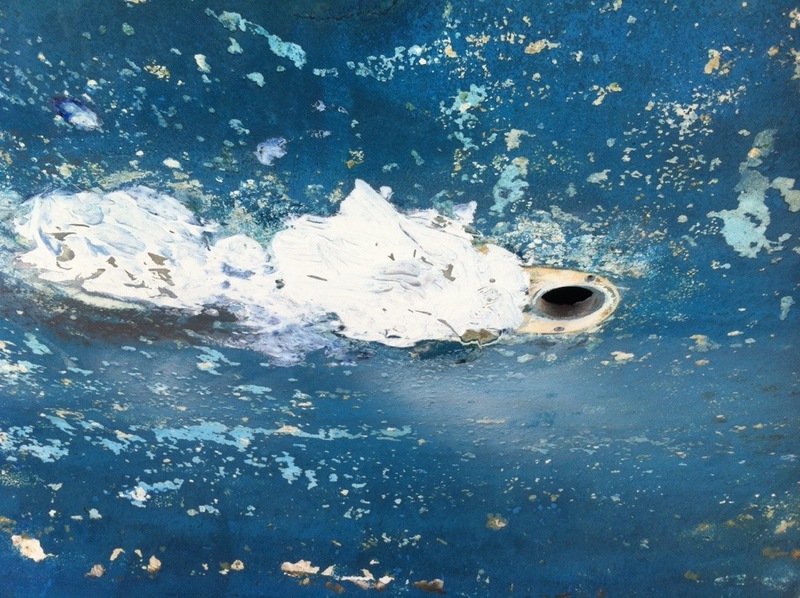 Our Catalina is not really designed for ocean passages as it is, but you never know what the future holds. Good pilot charts and course selection, timing for the weather, even our C30 could make a similar passage, just at a slower speed. 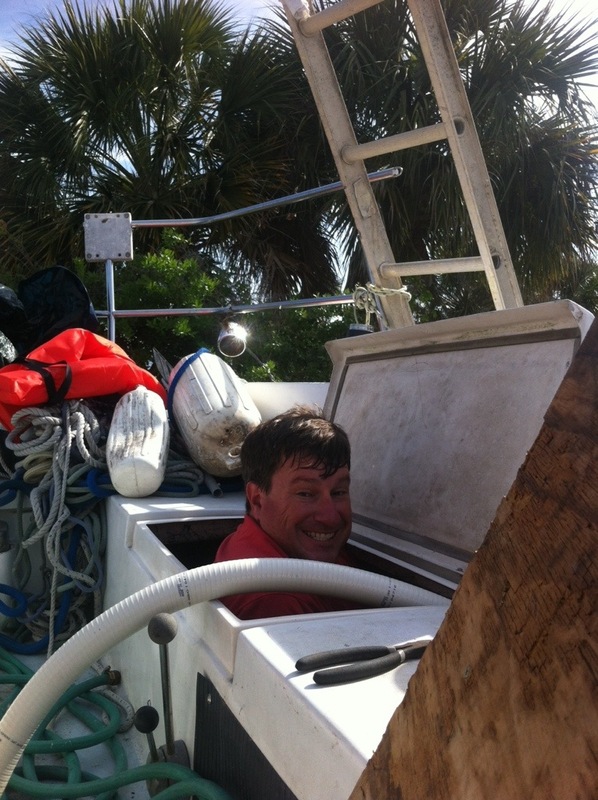 Just for giggles here is a link to data on the boat that called for help. Here is our boats data. As you can see although only 6 feet longer the HC outweighs out boat by 5 tons. Has twice the tankage for water and fuel and is generally sturdier in design. If casting off the lines and living on the boat was compatible with all of Lori and my plans I would do it in heart beat, but it is not. As it is I fight the urge to chuck it all and go. Really at this point we could survive 3 or 4 years until poverty reared its ugly head. 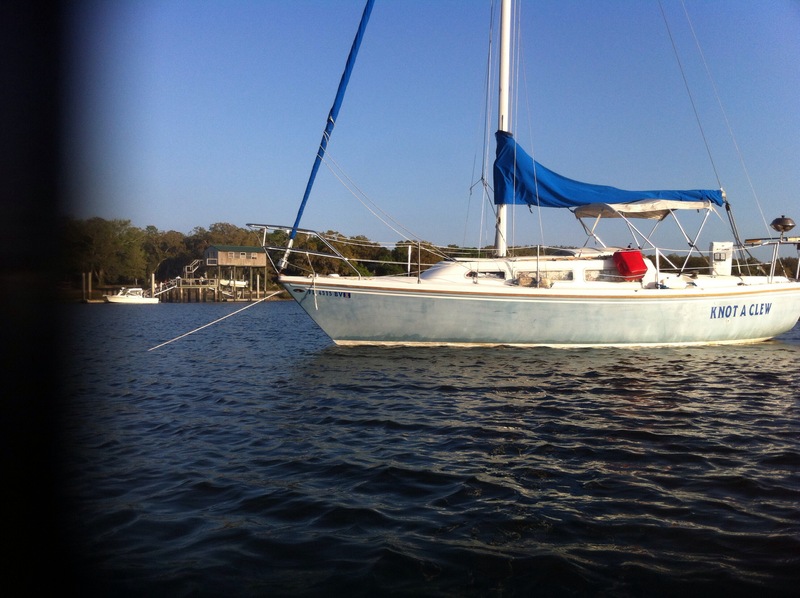 So the plan stand, 8 years until summering in the Caribbean and in about 18 if the bug is still there we go full tilt and sail the blue. Let us face facts, our Atomic 4 is beyond its service life. 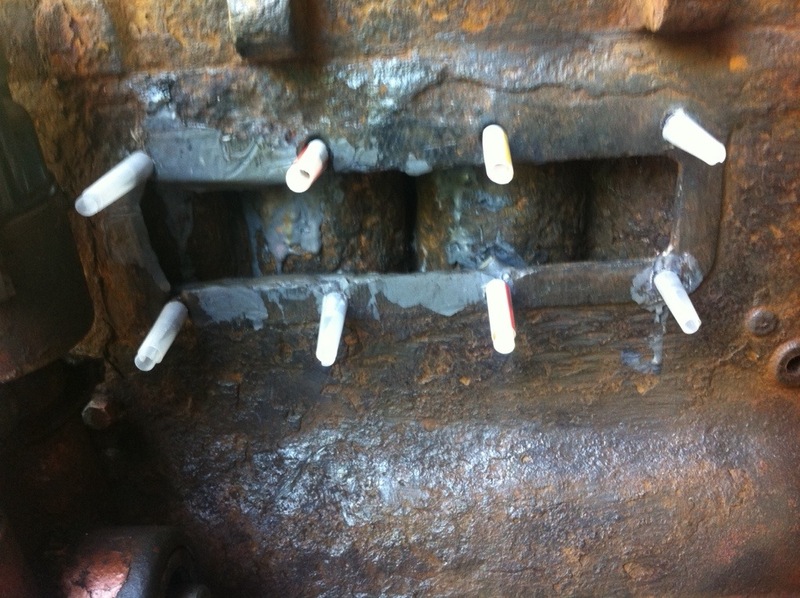 Due to raw water (salt) cooling the water jacket is corroded to the point of being unable to even install the cover plate bolts. Here it is with some of the new studs dry fit. 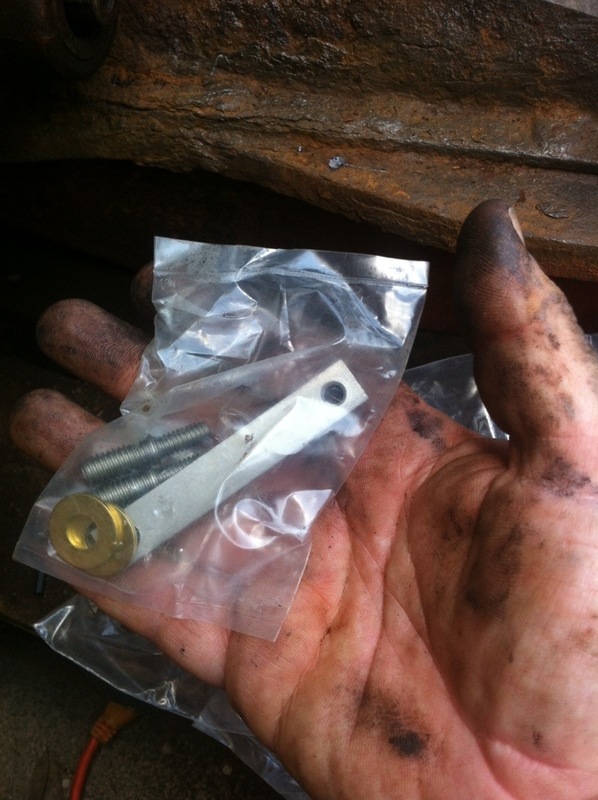 I purchased the stud kits from Moyer Marine, made of stainless expressly for water jacket rebuilds. Here are some is one of the stainless backing plates. 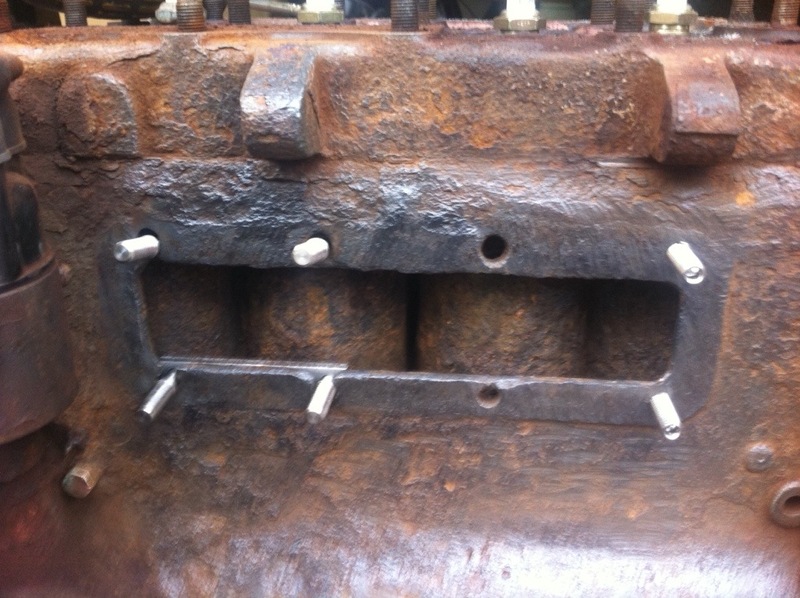 I have started to do the rebuild using JB Weld to build up the rotten metal. I slathered the backing plates with the Weld and installed our new stainless cover plate to ensure the studs are lining up properly as the weld sets up. To keep it from welding the cover plate to the block and studs as it set I slathered the plate , expose studs and nut with shoe polish. I had read online that a lot of gunsmiths bed their barrels with weld or a similar epoxy, they coat the barrels with shoe polish as the wax acts as a release agent. 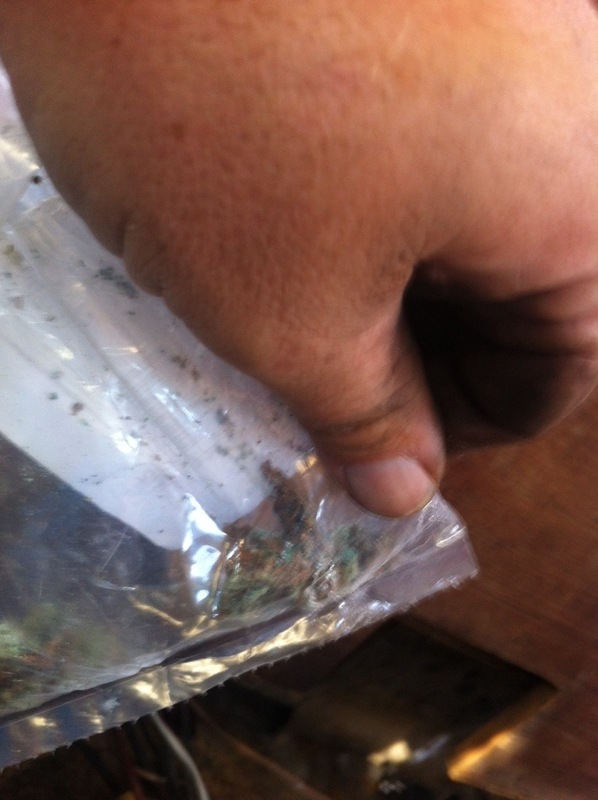 I also used some wax paper as a gasket for good measure. Here the motor is setting up. Hopefully I will only need to do one more application of weld to get the mating surfaces right. I also pulled the carb for cleaning. Torqued the head bolts and did some general cleanup. I will have to give Moyer a call for some parts. I end this post with a A4 hand crank demo. This is not me or anyone I know, just a video I found on YouTube..
Painting our wagon Red… Back to them mechanical bits…..
What a great weekend it has been so far. 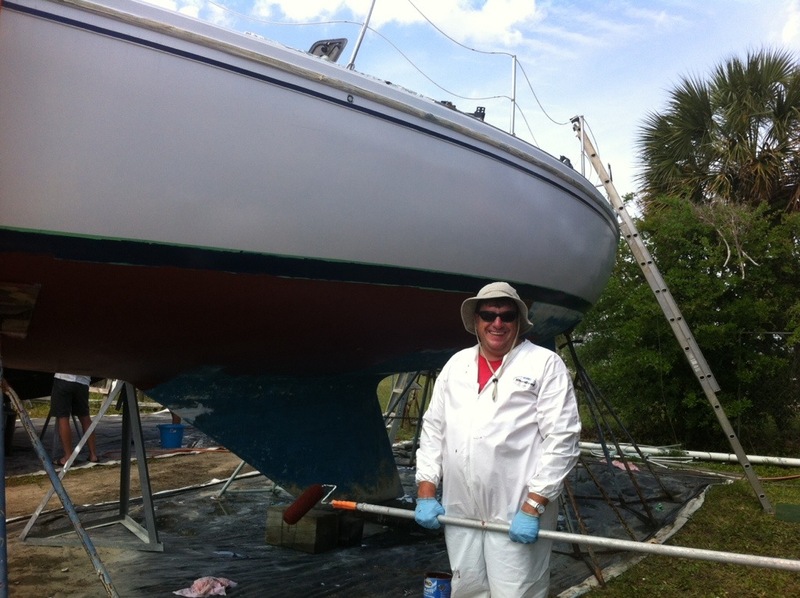 First I want to mention how happy we are to have heard from Bob York, the first owner of our boat. You can see his comment over on the bottom of the “Ships Company” page. Thanks Bob. After work Friday night Lori and I went to the international dinner at the Church we attend. A really good night with interesting missionary speakers and great food. Not to be missed. 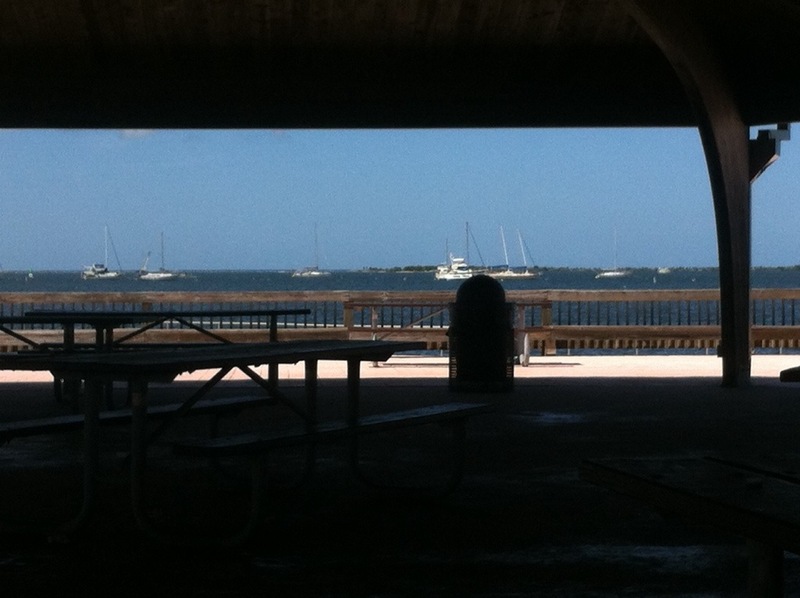 After the dinner we ran by the house and grabbed Charlie, Titusville being our final destination at 11:30. When we got to the boat we were surprised to find our boat had been moved 3 feet to Port and we had a new neighbor tucked in next to us. The move had left our extension ladder ajar and unsafe to climb. I readjusted it in the dark but because it is cabled and locked to the stern pulpit along with the step ladder (same cable and lock) the result was a lot of banging of aluminum ladders at close to midnight in the dark with only a iPhone as a light source. 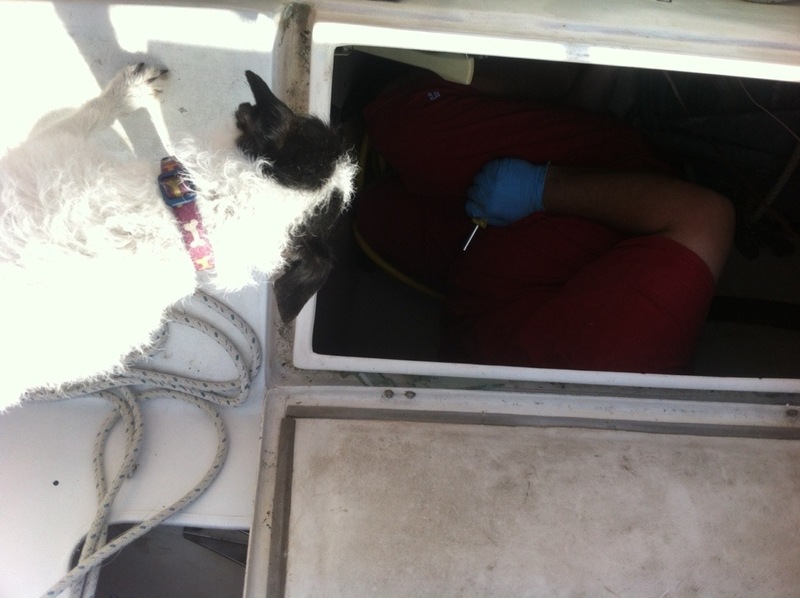 Lucky for use we were able to access the boat and disappear below before lights came on and shoes started flying. Saturday morning we were up early and I was enjoying my customary mug of coffee. Stepping up into the cockpit I looked over towards our new neighbor. Our former neighbor Rick on the other side of the new arrival was also up enjoying a coffee, he saw me and called across to me, “It looks like someone has finally come between us.” Very funny and well timed. After coffee we got to work prepping for the new bottom paint. 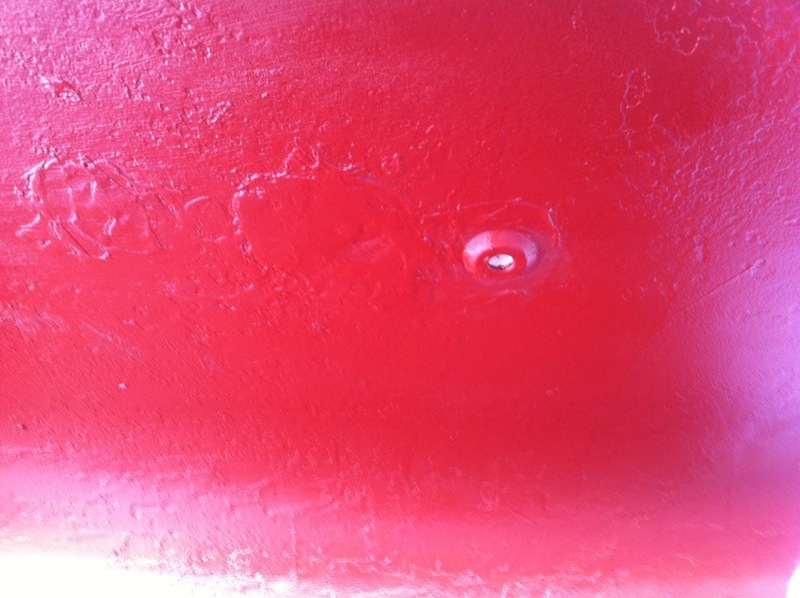 This involved using a recently purchased nylon brush on our drill. 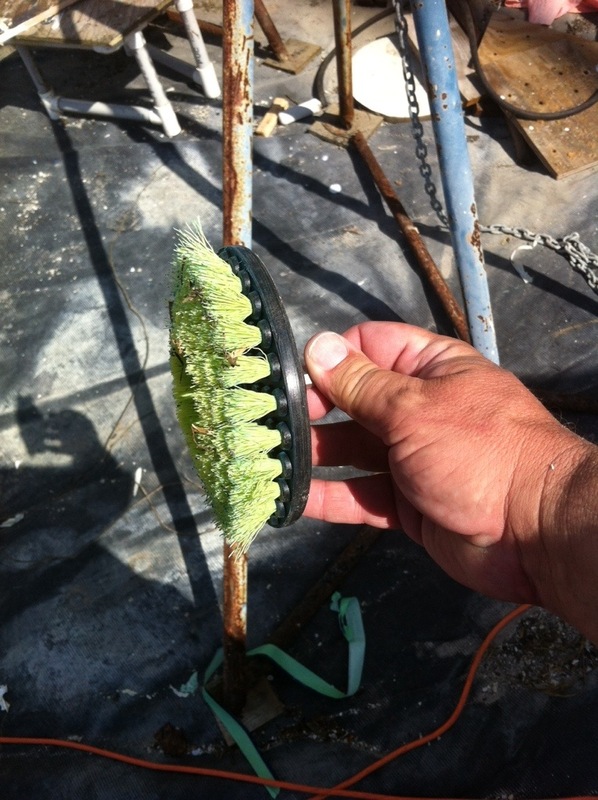 The drill brush combo made quick work of all the small crustacean remnants still clinging to the hull. After that Lori and I got to work on finishing repairs to the hull from removing the transducers and installing the final thru hull. First I had to patch the two holes on the interior. Filling them with loose fiberglass. 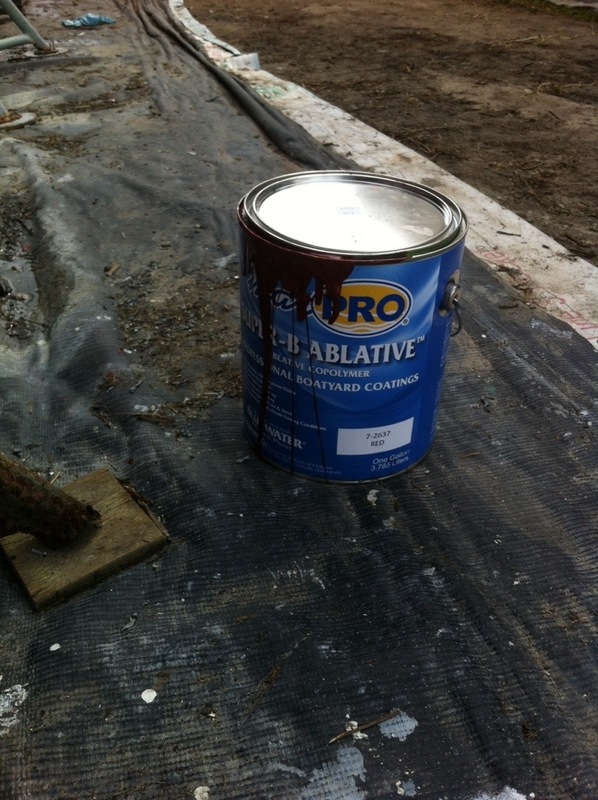 We then mixed up a two part polyester epoxy, filled the holes and then laid on three layers of glass cloth. Now we were ready for the new thru hull. Lori and I worked together using our cell phones to talk as she placed the exterior portion of the fitting and I screwed on the interior. 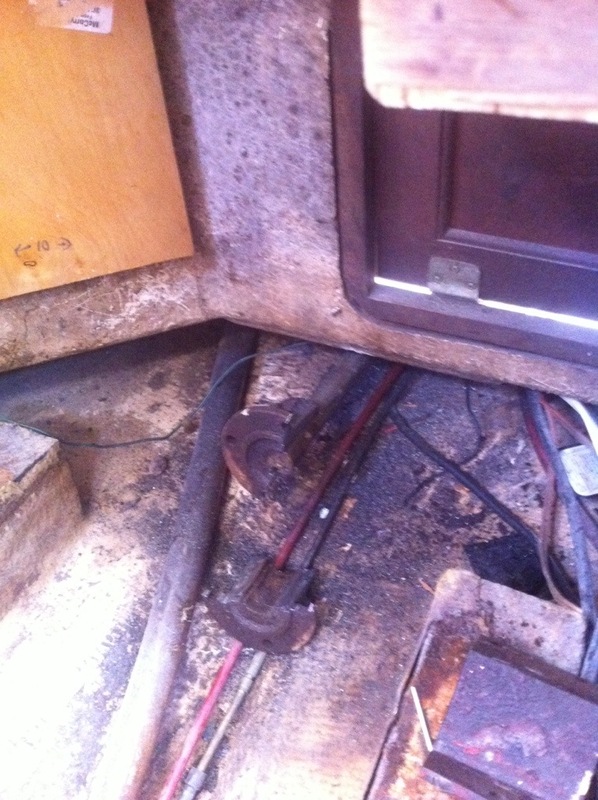 We actually did this twice, first dry fitting and then a final fitting with gobs of 3M 5200 sealant to bed the fitting. 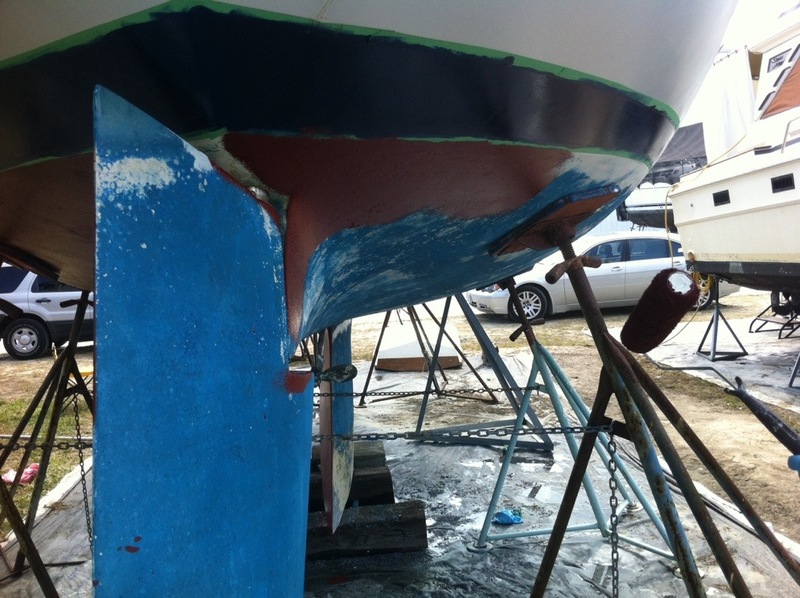 After finishing the thru hull I applied a second coat of Marine Tex epoxy to the exterior of the two patches to smooth it out. We were finally ready for paint. 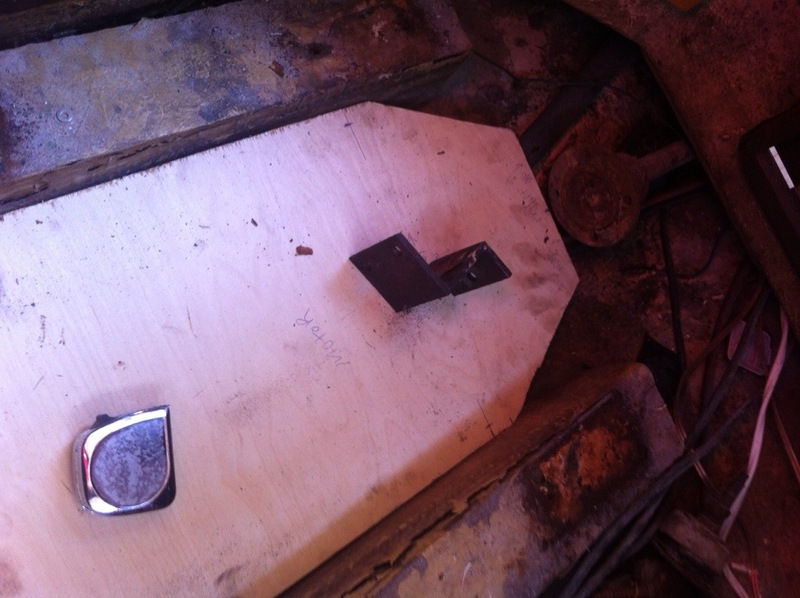 I dawned a paper suit (poopy suit) as I did the lower sections of the hull, keel. A lot of dripping. 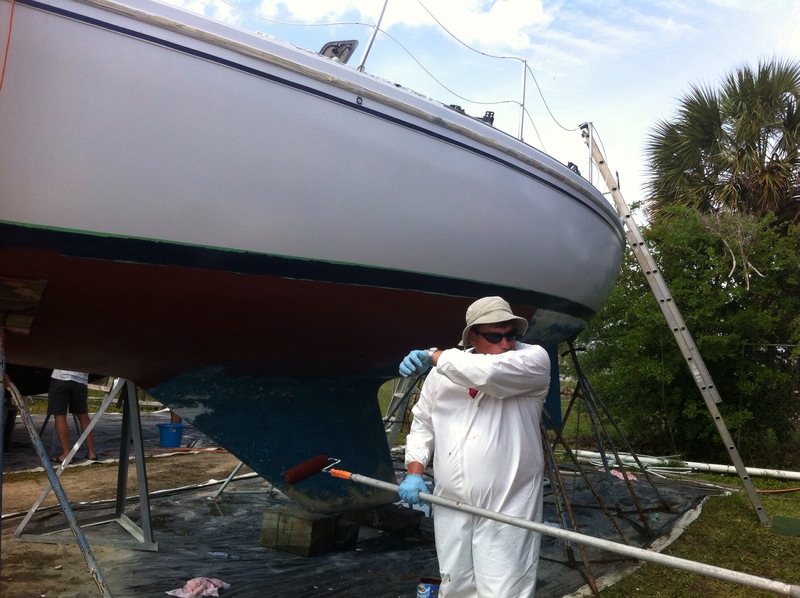 Then we got to business, finally our last section to paint before she goes back in the water. My attempt at being artsy, note Lori’s legs. After getting the first coat of paint on we called it quits for the night. Dinner consisted of New York strip at Chef Larry’s followed by a trip to the movies. We saw Captain America: Winter Soldier out at the Sears Town Mall in Titusville. A nice quiet place with no line to wait for seats. The movie was outstanding, I do think the Captain America franchise is one of my favorites. Sunday morning after coffee a I took care of a few odds and ends. 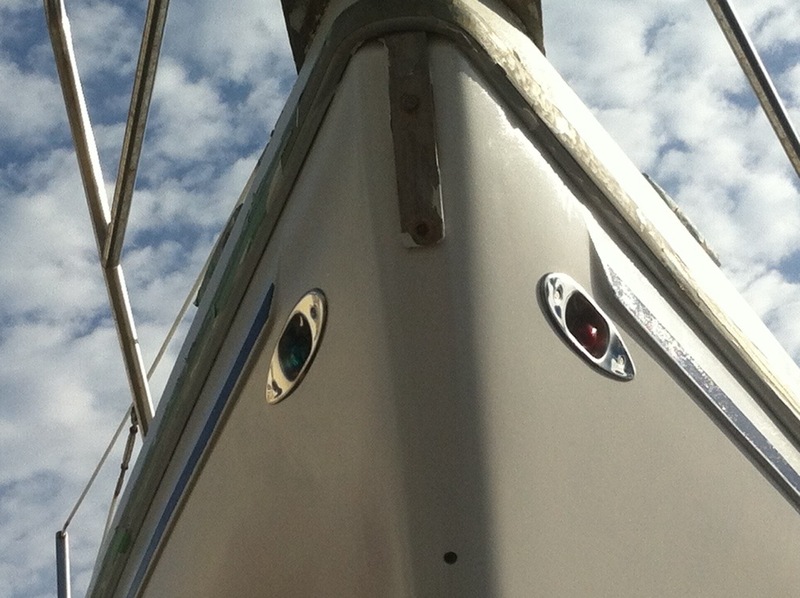 Installed a set of new Navigation lights, now I just need to wire them. 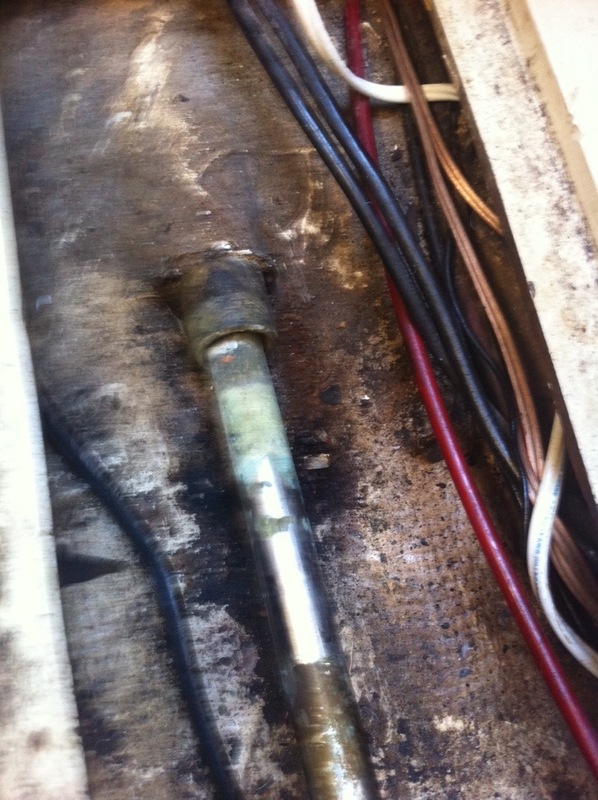 I then repaired the manual bilge pump. At sometime in the past someone thought it was a good idea to install a T valve so the bilge pump could be used to pump poo overboard. 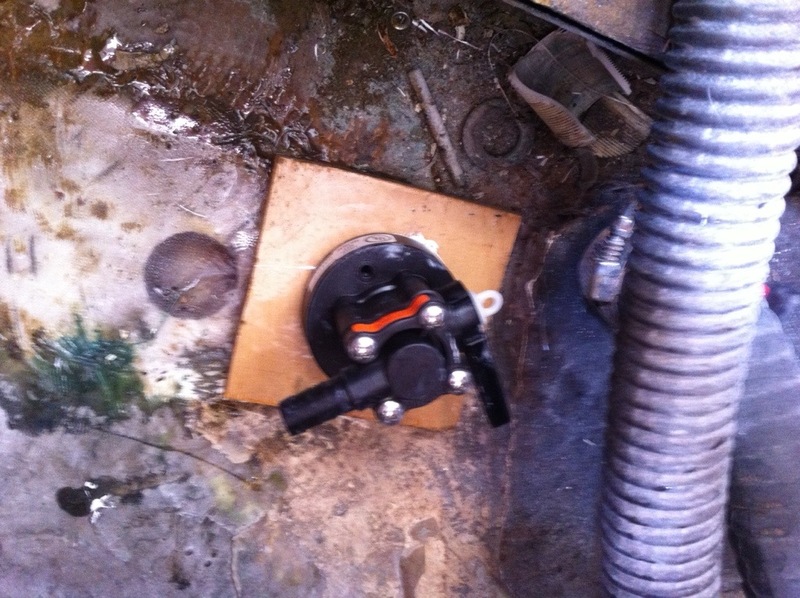 I removed this option as we now have a proper electric waste pump for that. Surprisingly the old pump worked like a champ one the new clean hose was installed. 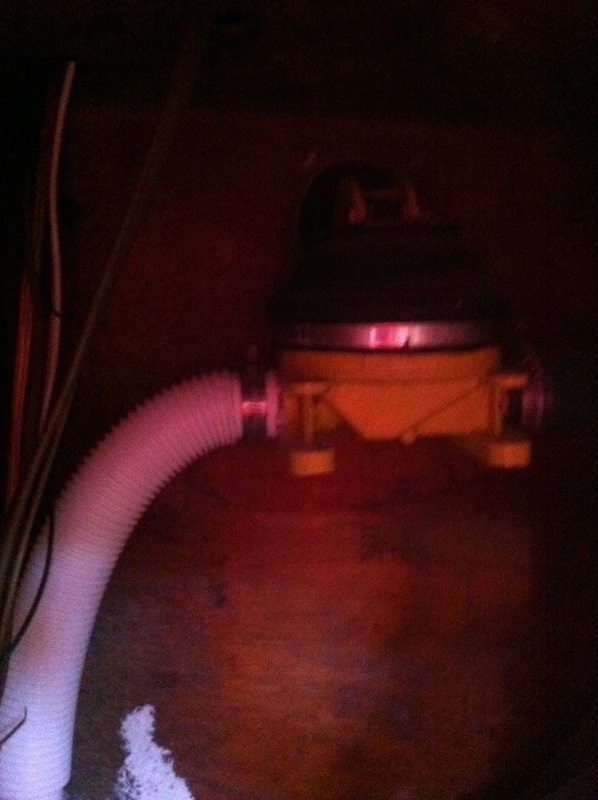 Manual bilge pump with new hose. I then replaced the last part of the old waste system, about six foot of hose from the pump out deck fitting to the pipe under the ice box. Sweet, I can fit in the locker, new hose being snaked in. Charlie making sure I do it right. 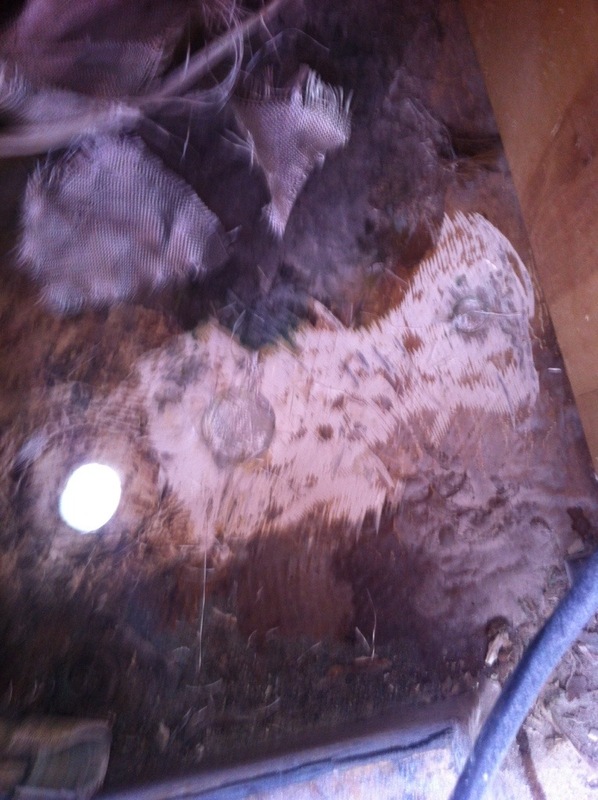 After installing the hose we filled the waste tank once again. Marking the outside of the tank with a sharpy we hope to find it has not leaked when we get back to the boat next weekend. 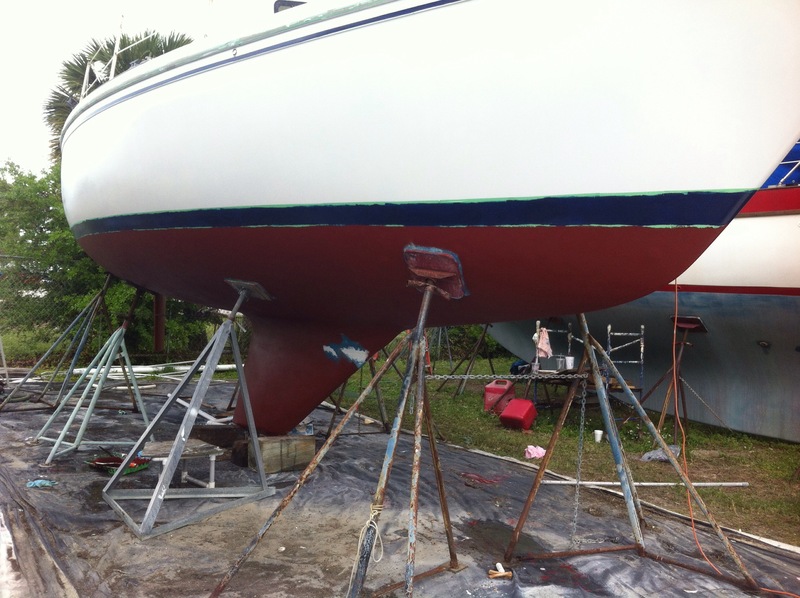 After finishing the plumbing we put a second coat on the bottom of the hull. 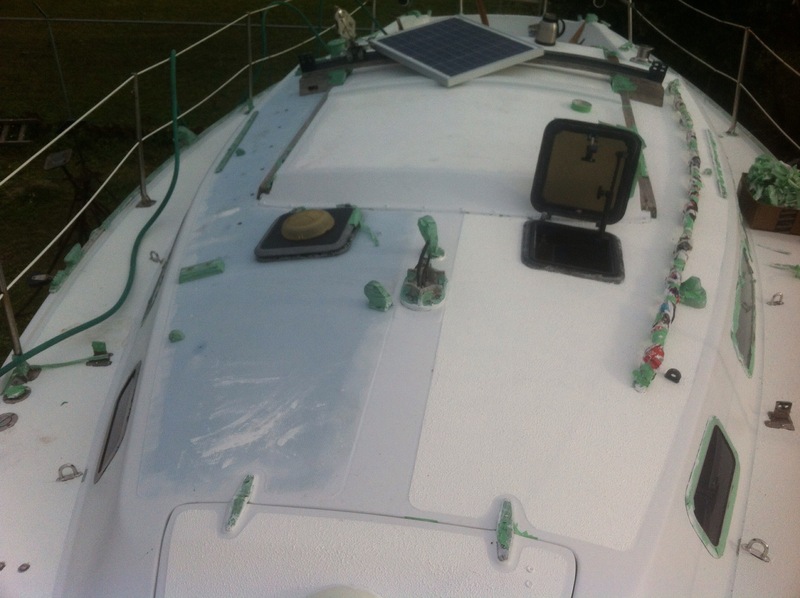 Here is our patched holes and new thru hull. Here she is with her new bottom, all done. 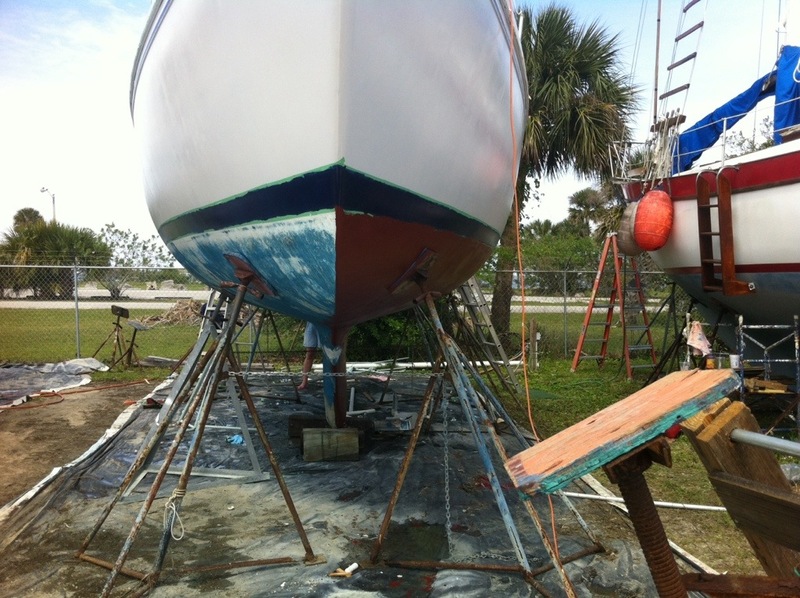 So we are done with painting until she is back in the water and we move on to doing the mast and finishing the cockpit. 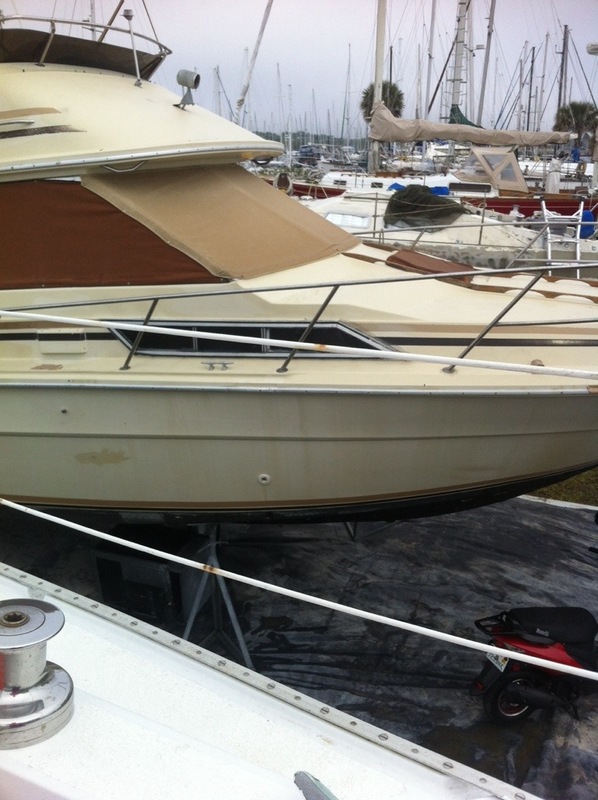 Starting Monday we will be working on the engine and propulsion system. If we can get her she can be put back in the water. Progress…..